Chemical free is the way to be. If you could choose between two cleaning products—one that contains sodium hypochlorite, lauramine oxide, and sodium silicate; the other, water, vinegar, and essential oils—which would you choose? I’m not a chemist and cannot, therefore, declare with any authority that commercial cleaning products—with ingredient labels that read like university chemistry texts—are harmful. I am, however, entitled to my humble opinion. There are definitely some messes that require industrial-grade cleaning products, but for day-to-day household cleaning, they aren’t always necessary. Pantry staples like vinegar, water, and baking soda cut through most grime surprisingly well—and they’re less abrasive than most commercial products. As a consumer, this brings me a modicum of peace of mind, much in the same way that buying food with four ingredients on the label instead of fourteen does. 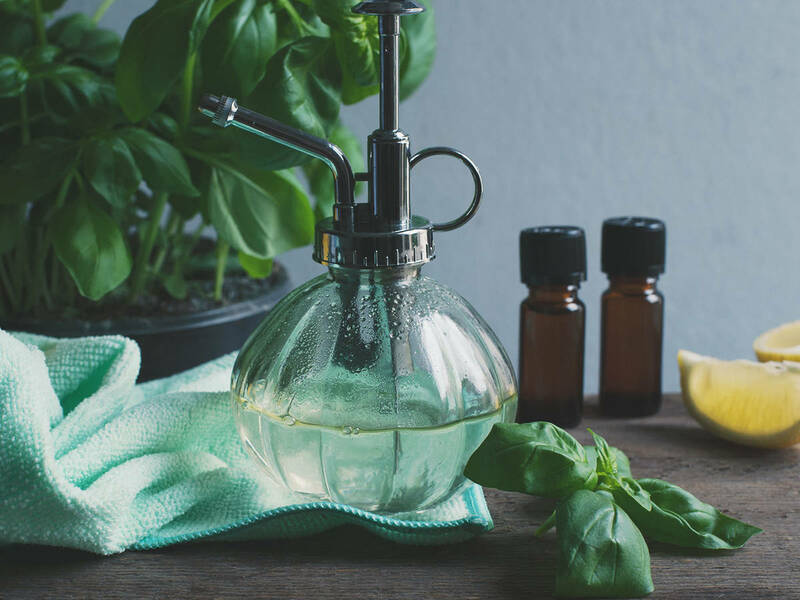 You can easily find instructions on the web for how to make homemade cleaners for every part of your home, but to get you started, here are five all-natural cleaners for the kitchen. Chances are you’ll have most of what you need at home. If you don’t have a spray bottle on hand, you can pick up one here. It’s important to use one made of glass because plastic can leech into essential oils over time. Don’t have any essential oils at home? We recommend using basil and lemon. Combine ingredients in a spray bottle. Shake vigorously. Use on kitchen counters, stove tops, cabinets, etc. Mix together baking soda and water to form a paste. Spread evenly over the bottom of oven and other areas in need of cleaning. Let it sit overnight. Thoroughly scrub in the morning and then wipe clean. Pour some vinegar into a spray bottle and spray in oven. Thoroughly scrub again and then wipe clean once more. Combine ingredients in a spray bottle and apply to floor. Polish floor with a clean cloth until it shines. Combine ingredients in a large bowl or bucket. Apply solution to floor using a mop or towel. Add water to a small saucepan and bring to a boil. Add three to four drops of essential oil, reduce heat to low, and allow scent to permeate through house.